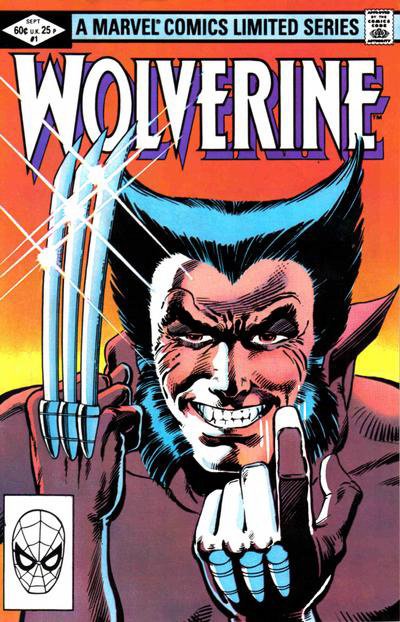 The first issue of the 1982 limited series, Wolverine, starring the popular X-Men character of the same name was the first comic I ever bought off a comic store wall. For those who are unfamiliar with comic shops (yeah, I know, that’s most of you), the method of displaying prominent, pricey back issues used to be hanging them on the wall behind the counter in what amounted to a giant mural of comic covers arranged in a grid that went from floor to ceiling and from one edge of the wall to the other. This was an incredibly cool way to showcase comics. As a kid, when you bought an issue off of that wall (and left a hole in the collage), it made you feel like some kind of comic-acquiring rock star. When I saw the first issue of the series with Frank Miller’s cover drawing of Wolverine in close-up, beckoning an unseen opponent to step forward and meet his demise, I knew I had to have it. When I finally cracked open the book, its classic opening line only re-confirmed that I’d made a fantastic purchase. "I’m the best at what I do. But what I do best isn’t very nice." That’s some serious attitude. That’s Wolverine. Or, at least that was the Wolverine of the comics, especially in the first decade of his existence.